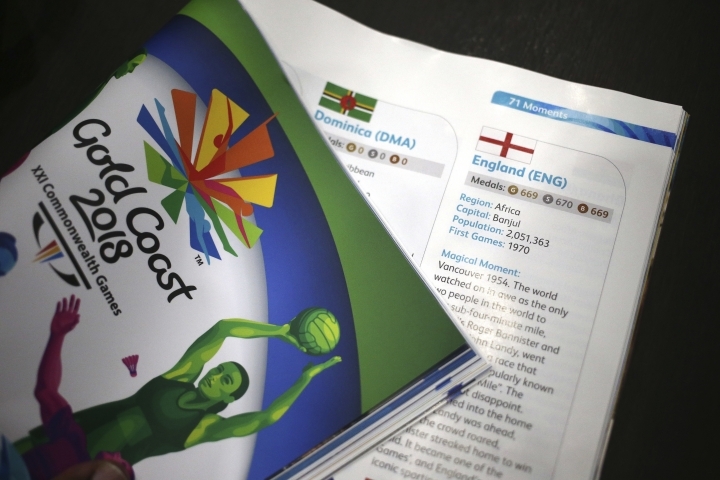 GOLD COAST, Australia — In an accidental case of the old empire striking back, Commonwealth Games organizers have listed England as part of Africa in the official program. The colorful souvenir edition lists the English capital as Banjul (instead of London), locates it in the Africa region and notes its population as slightly more than 2 million. That mirrors the details listed — correctly — for Gambia, only recently restored to the Commonwealth Games, directly underneath on Page 97. Hours before Prince Charles was expected to open the games on Wednesday, Gold Coast 2018 chief executive Mark Peters explained the blunder as an "overprint" as organizers rushed to accommodate Gambia's re-inclusion just weeks ago. The African nation did not compete at the 2014 Glasgow Games after withdrawing from the Commonwealth in 2013. A change of prime minister in 2016 led to the readmission of Gambia last month, and the country has six athletes competing on the Gold Coast. "We already had everything ready to push the button to print (and) had to do a lot of fast footwork," Peters said, explaining on Wednesday that the error was noticed 10 days ago. "We went and spoke to England and said 'Congratulations, the Commonwealth is changing and it has since Brexit. A part of you is now part of Africa.' Luckily the Gambia is all good." Peters said organizers went to England officials and offered to pulp the print run and start again, and even considered putting stickers over the incorrect information in every program. "They were emphatic that end of the day, they're so pleased to be here and everything else that has been organized, they implored us not to do that," Peters said. "We're doing a special reprint of 500 to give to the English and the CGF to make sure that in terms of the records, that's done correctly." At least some African competitors didn't mind having some reinforcements. "Yes, we happily do," Nafisatu Umaru, captain of Ghana's women's hockey team, told a news conference called to discuss the opening ceremony later Wednesday. "England has made a great impact for us." She was referring to England's four-year commitment to helping her hockey team qualify for the Gold Coat tournament. Comment was being sought from Gambia. And while England may have been listed as an African nation in the official program, as far as the Gold Coast's international student population is concerned — they're one big human rainbow. More than 200 students representing the 130 nationalities gathered on the sands of Kurrawa Beach at 7 a.m. in a show of cultural diversity — none caring about the program blunder. Among them were Jamaican Celia Innerarity, 44, and Zimbabwe's Jermaine Rusike, 21, who simply did not care. "There are so many things that people use to tear us apart ... but at the end of the day we are all the same and this is what we should be celebrating ... this is what the Games and community is about," Innerarity said. Innerarity, a former masseuse with the Jamaican track team, is now studying nutrition and dietetics on the Gold Coast. For Rusike, the games which bring 71 countries and territories of the British Commonwealth together are a chance to celebrate the city's multicultural community. "I am from Zimbabwe but this feels like home," said Rusike, who is studying law and is among the 25,000 international students in the region. "The Coast has a great vibe and the Commonwealth Games are about celebrating diversity — and when the Games start, nothing else will matter."